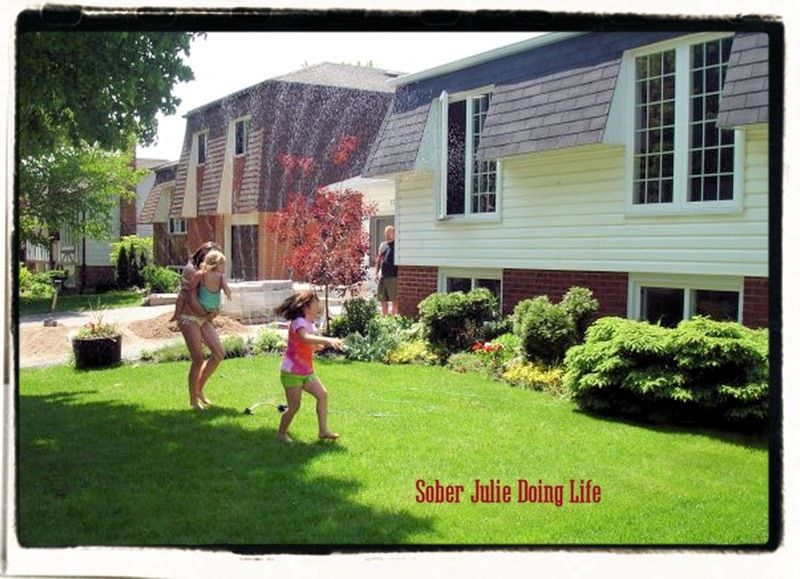 You Are Here Home » My Life » Family » Thinking of a Home Renovation? Hubby has an eye for seeing what isn’t there and how to make it happen. I have many desires for a plush life surrounded by beautiful sights. Now I am going to share some of these sights with you. As the days get longer and the grass becomes greener I begin planning. It’s an annual event for our family, Hubby and I plan individually and then meet to negotiate what our Spring/Summer projects will be. This is never a simple matter, when we bought this home we realized it was a fixer upper and yet we often have conflicting choices for the project of choice. These negations aren’t solely based upon budget, time involved is a factor as well because we usually do the work ourselves. Discussions ensue, we carefully tread around one another gauging the importance of each project in each other’s mind. How badly does He want it? What will I have to give up to achieve what I really want? Let’s be real peeps, I always pad my list with projects I don’t really care about. It’s a simple strategy which any negotiator worth their salt is aware of and implements where possible. How many times have I gone out and made a purchase only to return and justify it by saying it was on sale and I really wanted to buy more but held myself back? Moving along….I thought to share with you all some of our past projects to help you see my perspective on the day you open my blog to find my post on this year’s project of choice. I may require sympathy or a knock on the noggin so I’ll try and present the house Reno history succinctly. 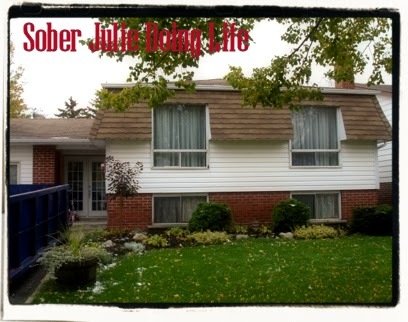 In this photo I had rebuilt the front garden, planting perennials, shrubs and a tree. We had already replaced the front door and the roof demo was about to begin. That brown roof was the bane of my existance, it was performing poorly at the basicis of its requirements. Leaky and fugly it had to go! I don’t feel the need to explain why the bad ’70’s windows had to go. When I looked at the front of my house I always heard…bow chicka wow wow in my head. Oh look! A spanking new black roof and oh what’s that….why yes it’s new windows! Look how happy the children are. 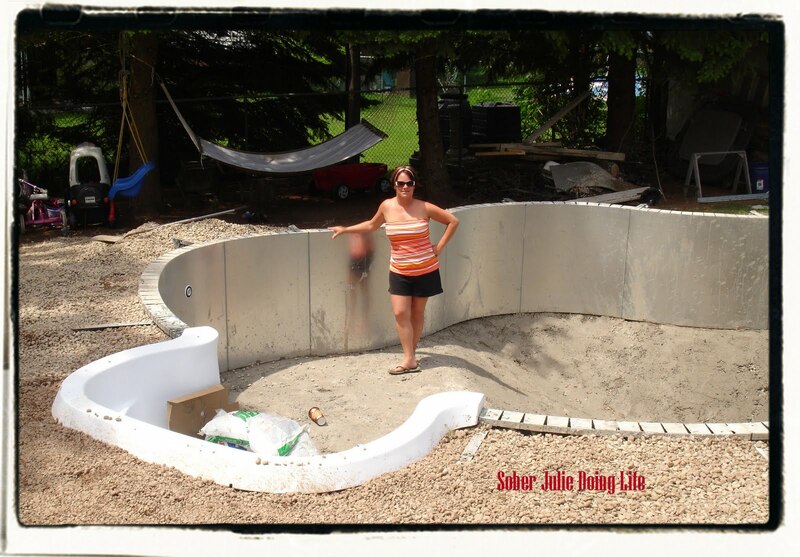 What a great picture but a sprinkler wasn’t enough, I’d always dreamed of having a pool….now that was a HUGE undertaking! 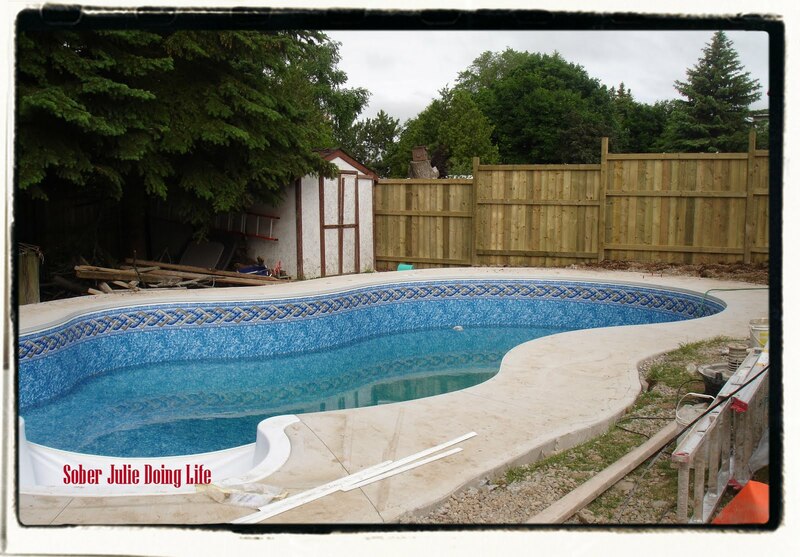 We found a fantastic reputable Pool install company, got the permits and away we went. This is one shot of me fantasizing on a warm day, notice all the construction junk in the rear right and the chain link fence which had to go. And here it was, notice the fence? Hubby put in each 4×4 and I screwed in EVERY board. 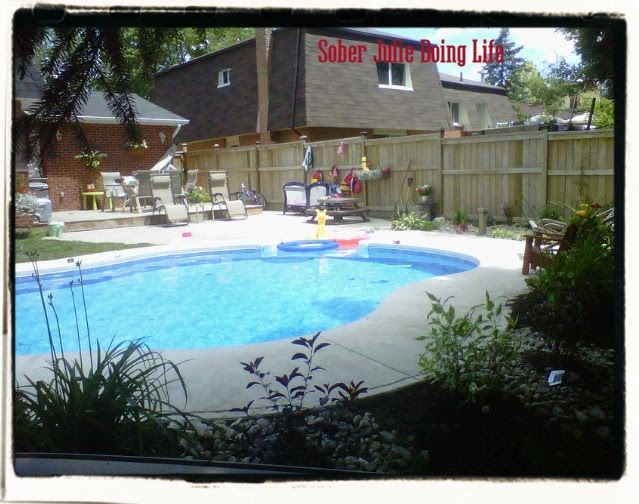 This is how the yard looked for a year, we had a lovely pool and no landscaping which meant alot of sandy feet trapsing from the deck to the pool. I’d like to point out that Hubby and I are Reno risk takers, we research everything and get quotes of course but we figure what the heck, how bad can we do? Most often we take the risk and although there’s always hiccups we end up with success. 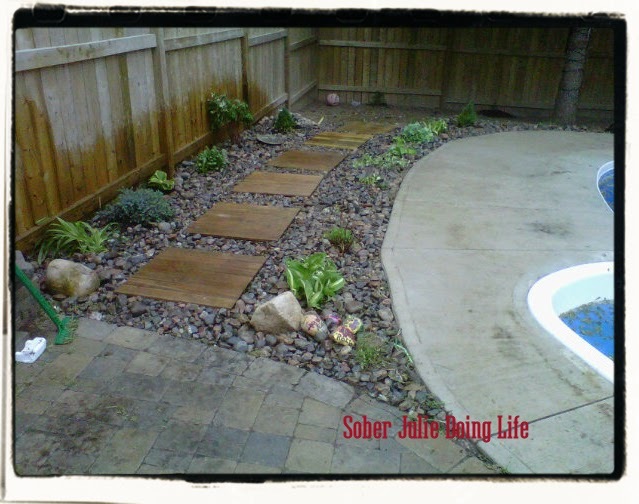 The following year we began landscaping, installed a patio around the deck and gardens. At the back of the yard I’ve planted vines which I hope will add greenery to the fence, the Spruce trees were trimmed from the bootom and I’ve planted 3 gardens at the edge of the pool with Tiger Lilies, Dogwood bushes and I plant a few showy annuals. We placed river rock between and around the gardens to frame them. Oh and Hubby put up a hammock for himself for a rest after alot of digging. There is still so much to be done back there in our Oasis, but like me it’s progressed and I love seeing the difference. As we go through our work this year I am planning on blogging about it, why not? It’s interesting seeing what others can achieve right??? Seriously if you’re thinking ﻿Reno and your mind immediately groans….it’s often not as bad as you think, just ensure that your spouse/partner is well fortified with sugar and all will be well. Soooo impressive!!!!! It all looks gorgeous. I mean, of course the pool looks beautiful, but the windows made a night and day difference! I love it! My husband and I are just starting to get into little projects, but nothing like what you guys do. And when we were shopping for our home, the realtor assured us we wanted to *find* a house with a pool, not put one in. So, props to you for taking on such a huge task! The pool construction was an inconvienience for a week but the payout was HUGE. I actually like the outdoor renos so much more than interior. Great post! Doesn't it feel good to show off the fruit of your labors?We've done quite a bit of work to ours as well (rebuilt fence, laid 3 paver patios, a retaining wall, killed off, tilled and sodded the lawn and laid an incredibly long paver driveway. 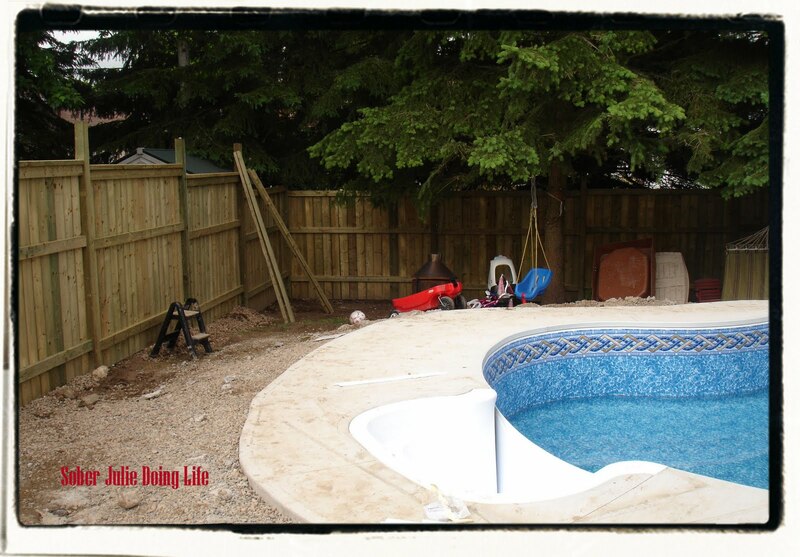 )Best part: it's done and I get to enjoy it.BTW, SO jealous of the pool and the hammock! How fantastic! Our house needs a lot of work, just like that – new windows, new deck, backyard gardening (wonder why, we live on the same street!) but alas, we haven't a dime to spend. Hopefully… one day we will have an oasis too. Done Bill, funny I hadn't read this post yet…I linked to you through a friend ;)I sooo wish I had a direct reply button but thanks for all the comments friends, I loved sharing it and intend to keep doing before/after and probably during pics.